fève(*) that one lucky person will find. How it works is one person goes under the table while another cuts the slices. The person under the table calls out a name to give a slice to and continues till all slices are cut. 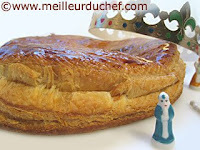 The winner is the one who finds the fève in their slice and is crowned the "roi" and proudly wears the gold paper crown that is given with each galette. The fèves range from religous figures to Disney characters to random things. It is best to warm the galette before eating. If you like almond paste, these are fantastic. Its fun to visit different bakeries and taste the different galettes and see what fève you will find in your galette. The galettes are usually around till mid February.